Established in 1933, Merewether Golf Course is located in the heart of Newcastle and is favourite of many golfers across the region. Merewether Golf Club’s Golf program can be found by clicking here. Please note that events in the program may shift and we recommend checking back in on a regular basis. Merewether Golf Course is set among eucalyptus tree-lined tight fairways with strategic bunkers and formidable water hazards. This challenging 18-hole layout has a wonderful variety of golf holes with excellent year-round conditioning. Merewether Golf Club offer one of the best practice facilities in Newcastle. The practice area includes an area for the use of a range where you can use your own balls. In addition we have practice putting greens and a practice bunker which mirror the course playing conditions. Please note that these facilities are only available to members and their guests, and to visitors who are playing the course. Merewether Golf Club offer one of the best practice facilities in Newcastle. The practice area includes an area for the use of a range where you can use your own balls. In addition we have practice putting greens which mirror the course playing conditions. Beyond the inside points, at ground level, of any line of white stakes with black tops or fence posts defining the boundary of the course. Defined by red stakes, lines or dots. Play is prohibited from a cultivated garden bed identified by white stakes with a green stripe. Note: All other planted areas are an integral part of the course from which the ball must be played or declared unplayable. (c) is not in a penalty area or on a putting green. Staked Trees and Shrubs are no play zones. Note: the stakes are Immovable Obstructions. If it is known or virtually certain that a player’s ball hit a power line or tower or a wire or pole supporting a power line during the play of holes 2, 3, 8, 11, 12, 14, the stroke does not count. The player must play a ball without penalty from where the previous stroke was made (see Rule 14.6 for what to do). If the ball is not immediately recoverable another ball may be substituted. Aeration holes (after greens have been cored or scarified). If a player’s ball lies in or touches an aeration hole on the putting green, relief may be taken under Rule 16.1. But interference does not exist if the aeration hole only interferes with the player’s stance or, on the putting green, on the player’s line of play. If the irrigator, its anchoring mechanism, or the metal guiding cable interfere with a player’s stance or intended area of swing, the provisions of Rule 16.1 (Immovable Obstructions) apply. 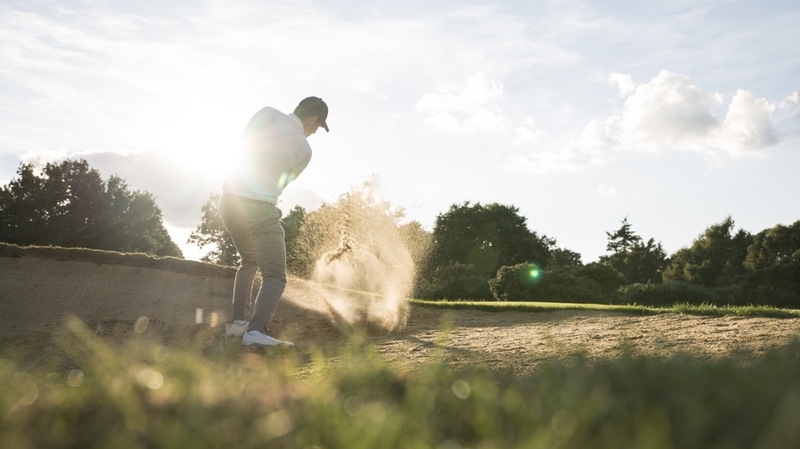 Drop a ball within 2 club-lengths of the nearest spot on the course (which is not in penalty area or on a putting green) which is not nearer the hole than the ball’s original position, and where Line of Sight Interference as defined above, does not exists. d) Artificial retaining areas, and pilings when located within penalty areas. We would like to thank our major sponsor Greater Bank for their ongoing support. Tee off at Merewether Golf Club – Sign up as a Member.